This morning as I walked, I saw a truck with a Trump sticker on it. I’ve seen it several times when I walk the dogs. And each time, I noticed the impulse that rose within me to “do something to it.” I then noticed the little “proper” voice within me begin to pump me up with pseudo-virtue regarding the decision not to. Eventually, if I pay attention enough, I also heard the internal response that acknowledged a slight fear that I would be caught and that someone with a Trump sticker might be moved to “do something” to ME. This morning, this is when I realized that the reaction to “do something” to eliminate or change the nature of what makes me uncomfortable is in these types of situations rooted in the very same intolerant seeds that have flourished in others. We are all related–the actions of others, virtuous or evil, speak to my own potential. I remembered the words of Gandhi and Martin Luther King, Jr., about the violent nature of the existence of “hatred in one’s heart.” I considered how Gandhi’s early history of racist bigotry might have informed his eventual awareness of how violence begins internally, often in the guise of the absence of outright aggressive violence. The impulse to eliminate, convert, insult, belittle, joke, or otherwise “do something” to that which makes me uncomfortable or frightens me; which challenges the boundaries for what I’ve learned or decided is sacred, holy, or right; or which triggers me in areas where I’ve been traumatized and moves me to hyper-vigilant defensiveness—these are seeds which can be nurtured to become violent, judgmental, intolerant…or can be repotted in a soil that nurtures my own capacity for understanding and compassion. Colonialism in the Americas and religious “holy” imperialism in Europe and elsewhere has given us a legacy that can feed these seeds with the impulse to convert and perceive the world with an inquisitional zeal and desire to forcefully or manipulatively, mold others into shapes and scripts that match ours. Agreement feels good, and we’ve learned that power is the ability to influence. But today I am mindful of how easily I could flip or switch, and how the seeds for violence are the same as those for mindful, compassionate, inquisitive, and engaged discourse/conversation. 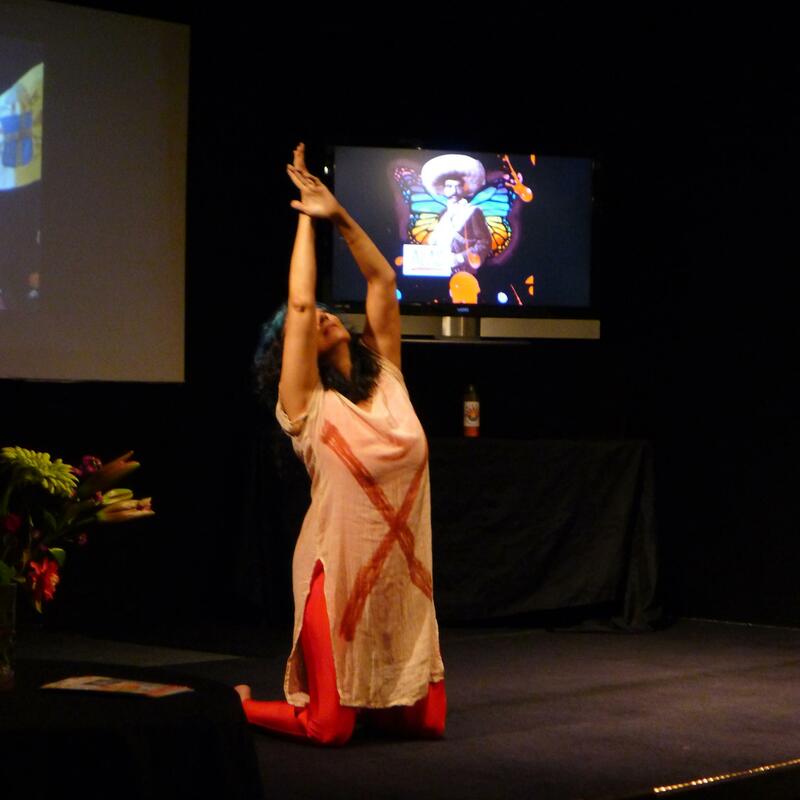 I have been a religious education teacher, a youth minister, retreat coordinator, professor of spirituality and Dean of a graduate program in spirituality headed by a prominent theologian.i am a yogini, with 38 years of practice and moderate experience teaching. I have been repeatedly drawn to a life of spiritual practice and yearn, often, for life in a religious or spiritual community. But I have never been able to find comfort within the often passively harsh control that is disguised as holy or driven by a religious mandate. What I have learned is how the sword of kindness and religion can often be a sword of intolerance, an attempt to silence or stop the expression of views or positions that make one uncomfortable. It’s passive aggression, micro-aggression, and hard to address because it is a wolf in sheep’s clothing. As a teacher and, a woman committed to justice and human rights, I cannot remain silent, nor distort through critique if I wish to address imbalance both outside of and within me. I must strive to be vigilant about what I’m actually trying to accomplish when I speak or act. And if there’s even a tad of a desire to feed my fear or seeds of righteous intolerance and vengeance or hate…I must recognize that these are seeds of violence. And I aim to prevent myself from acting or speaking, while correcting the way I’m addressing or feeding the seeds within me. What is sacred? What is too sacred to address? What is so sacred it must be handled tenderly, gingerly? And what is respect? What is dignity? What is the significance of one’s identity within a socio-cultural climate in which there are clear markers about what and who has more power, more privilege, more rights to a sense of entitlement? What is it that happens when we become so educated in the ideas of socially constructed reality, relativism, and postmodern/post-structural aesthetics that we can violate that which others hold sacred, private, intimate, or secret? 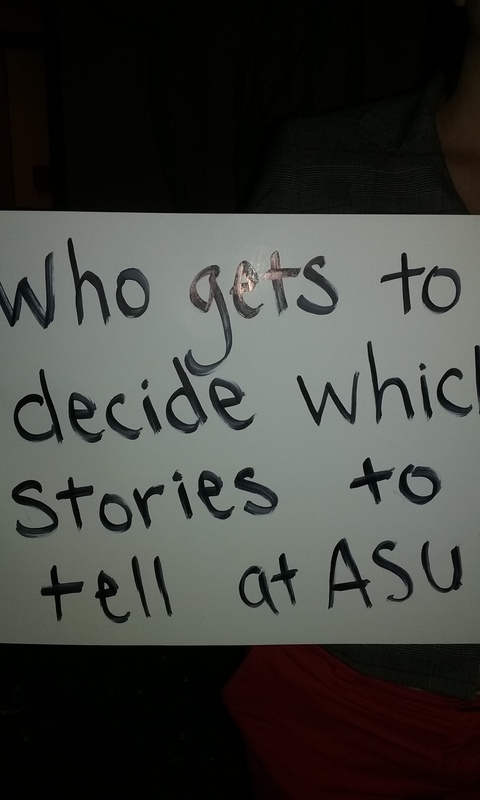 These are the types of questions that quickly came to my mind after seeing James DeMars’ “Guadalupe: The Opera” performed by ASU’s Lyric Opera this past weekend. Let me start by saying that the arias were beautiful, the set minimally powerful, the music by Carlos Nakai and Xavier Yxayotl heart-opening. I’ll come back to some of this later, though. 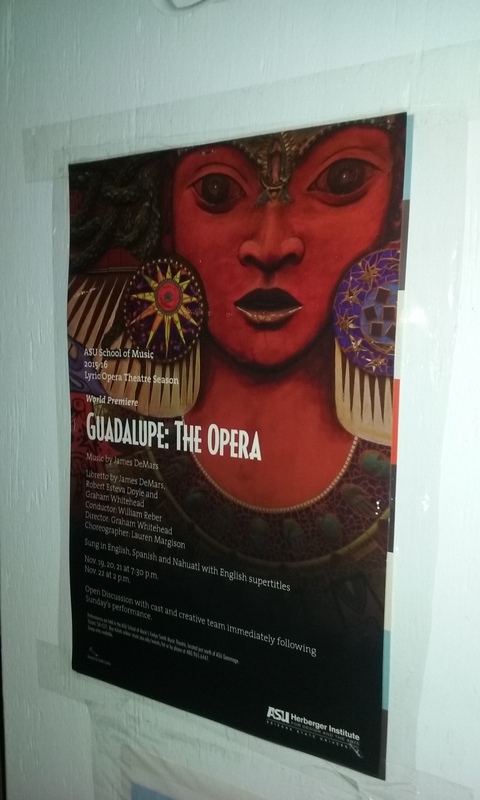 Because what was overwhelmingly present for me during the entire performance was the blatant rewriting of the “legend” as traditionally passed on, to, and through the Mexican people since 1531. And that’s where the paradoxes and contradictions complicate the repeated sense of violation that I experienced while watching the opera. You see, one of the best ways to confuse someone is to combine something they’ll wish to destroy with something they wish to hold sacred. And DeMars succeeded in doing just that, in a very parallel way to that of the Spanish Roman Catholic Church when they took the Aztec imagery and symbolism of Tonantzin, earth mother, and combined it with the language of Mary, Santa María, the doctrine of the Church, and the power of the Spanish Inquisition’s threats of torture and death. Let me just say that there are places to read what the original legend claimed the lady said, in native Nahuatl, the language of the Aztecs/Mexica. 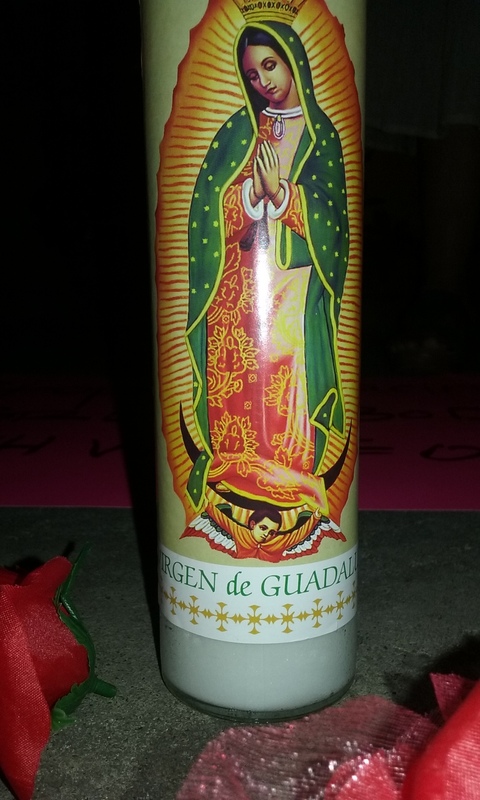 She did not claim to be Mary, but ambiguously referenced herself in a way that would confuse and mystify–and in fact some hold that she gave her name which had some phonetic similarity in places to the word Guadalupe, the name of a town in Spain with an associated image of Maria. And let me say that even the image on Juan Diego’s tilma was the “new” image, after the original image “miraculously” lost her crown a little over a hundred years ago when the first image began to show signs of wear and tear. The issue here isn’t “what really happened?” The issue is who gets to share the story in a semiotically powerful staging of beauty in images and sound, so that it imprints itself on the minds of those learning the story perhaps for the first time. Who gets to portray the Aztec heart sacrifice with melodramatically struggling victims (learn the history to know why that is relevant) in order to tie the heart sacrifice to the “beauty” and “wonder” of what DeMars’ cultural experts (provided from the Church) led him to sanctimoniously proclaim as the first “peace treaty” between the equally confused savage and real Spaniards and Aztecs? Who gets to decide that Tonantzin, called Guadalupe, has suddenly become mestiza, and ceased being a Nahuatl Mexica woman? Apparently, today, as then, it is not us. That is today’s neocolonialism. And let me say one more thing–despite the discordant imagery of what I could only call “hipster Azteca” members of the chorus, a Guadalupe dressed in the Eurocentric light colors of Mary humming in a way that sounded as if she would be more comfortable singing a southern Afro-American spiritual, and the repeatedly stridently flirtatious and millennial Malinche…despite all these things on TOP of the neocolonial propaganda we were being fed in the libretto…I had one very powerful reminder of who we are. When your words disrobe the emperor, suddenly the #politicsofturntaking become the self-righteous way to avoid admitting there’s a bigger picture. As press conferences began to be disciplined in the Reagan era, the gag on serious investigation and interrogation of our leaders began to be pulled tight on journalists. Who the hell cares if Miss Manners approves? We’ve been granted the freedom of the press so that the unwanted questions could not only be asked, but their answers reported so citizens will not be duped or manipulated by inquisitional, imperial, fascist and economically controlling factions and individuals. We’ve come to accept the control of the press to such an extent that those who ask hard questions, insist, and push are now disciplined by people who don’t even read the news or know much about what’s going on. And that, my friends, is a dangerous, very dangerous state of affairs. What the person answering the questions wants to do or say other than answer questions, is not the function of a press conference. The reporters aren’t “in class,” invited to high tea, or chatting at a polite reception. A press conference isn’t a place to gather the pre-selected soundbites chosen by a candidate or official. The closer we get to that, the more we’re watching the construction of propaganda. When I work with my “Masks, Transformation, and Change” classes, I always suggest that when the students are going to pick a habit to break during the course’s personal transformation project (PTP), that they try not to aim too high. We don’t know how intricately our habits are linked to other patterns, beliefs, and identities. No matter what habit we choose to break, if it’s really a habit, we will be rewarded with insight into the other things we do, think, say, and believe that help to keep us blindly obedient to its call. A good habit often goes unnoticed, like a well-behaved child who doesn’t seem to get noticed while his or her siblings who are misbehaving in many ways seem to get more attention when they do even one ‘little’ thing well. Similarly, we don’t notice that the reason a good habit goes unnoticed is that it’s become largely unconsciously motivated, and it takes little effort or none to remember to do it. When we have what we consider a bad habit, it’s the repercussions of the action that get our attention. Whether it’s our health, suffering an injury, a recurring argument with a loved one, or getting in legal or financial trouble, those things we consider to be bad habits turn around and bite us. But if they’re habits, just like the good ones, we are often unconsciously motivated or habituated in our behavior. When I am struggling with a ‘big bad habit,” I’m beginning to learn that often it’s the cumulative outcome of many other smaller habits that are related to similar thoughts and emotions that somehow move me to do what I don’t want to do. And when I focus on my “big” bad habit as my adversary, I often have failed to see the army of little bad habits holding it up. The thing about getting used to doing what I don’t want to do, what I “shouldn’t” do, what I know will hurt me or others, what takes me down a path of shame, regret, embarrassment, or suffering, is possibly strengthened by my desire to avoid the smaller things that have been out of balance in my life–perhaps for a very long time. When it comes to learning how to break the habit of silencing ourselves in the face of oppression or a serious violation of ethics, harassment or violence, in our workplaces, families, friendships, and even in our communities of faith, I believe that we are going to have a much harder time being an effective voice if we’ve got a lot of baggage built up around other things. For me, that’s often resulted in a really angry tone in my voice when I speak out, even when I’m not feeling enraged about the thing I’m discussing. But chances are that I’m pretty peeved inside about a lot of other little things to which I’m not attending. So I’ve learned that taking on small habits, one at a time, begins to have a cumulative effect, until ultimately I am not as threatened by the bigger challenges in my life. When I gain confidence in my ability to change destructive patterns in my life, even if it’s just being better about cleaning the house, or drinking more water in the summer, that confidence is present when I am facing the orthodoxies in my life that I truly want to challenge. And I can do it without losing my balance, because I’ll be standing solidly on level ground with my own two feet, rather than stumbling when I try to avoid stepping on the painful evidence of what I haven’t been able to change. Such manic and habitual thinking works really well to keep us in our place, we might think. But from the perspective of mindful heresy, it very often is working to keep us from our place. Being able to cultivate a connection to that inner voice that tells us what we are meant to do is a practice that takes courage, a connection to our hearts, and a relatively deaf ear to such things as markets, careers, images, and identity. Sometimes, the call to our hearts can come so piercingly that we are catapulted out of our little corners of predictable culture and identity, and we reach to the heights and distances that we are truly capable. We make a difference–one that is palpable and observable, and doesn’t need to be argued in a personal statement justifying one’s life or work. That’s when mindful heresy is no longer in a tug of war with the ego. I was moved to write today’s blog by the story of Narayanan Krishnan, and I invite you to watch this video with his story and ask yourself, “What would I do if I were as brave as this man?” And then realize that we are all brave enough to accomplish our life’s purpose. Have you ever felt yourself resist laughter out of a desire to “stay put” in the way that you were thinking or looking at something? One of the most enjoyable aspects of cultivating the potential to have more power than your own beliefs is to learn to laugh about everything.This doesn’t mean to laugh AT everything. To laugh ABOUT everything is to be able to see the humor in even the most stubborn and proper, fixed and “serious” things in your life. This has become one of the most enjoyable parts of my life. My reason for cultivating this practice is not to become someone who ridicules or fails to act with proper regard for things when they call for it, but to develop the ability to detect when I am rigidly opposed to seeing the humor in something. If I am attached to a particular way of seeing myself or another, to an argument I’m making, or a perception of a situation, so much so that I cannot step back from it and see what I’m doing, I’m probably not going to be able to laugh at it. Comedians are masters at making us look at the things we take for granted and do habitually. A good comedian can make us see what we do and think all the time, and when we see the nature of our own performance, we laugh. Everything is play. Even the most serious things in our lives. When I can let go of the most serious, sacred, and intimately held aspects of my life, enough that I can laugh at the humor in them, I have learned I am far less likely to be controlled by them. So, part of my practice to be more capable of responding authentically to the forces in my life, rather than responding out of a role or script to which I’ve become attached, is to watch comedies. A lot of them are my favorites, and I get a lot of help from watching them–mostly, if I am honest with myself, by relieving stress and just enjoying myself. My favorite comedies are in a way helping me to laugh at very familiar things, but probably also things that I’m already comfortable laughing at. The most helpful comedies to watch sometimes, are those comedies for which I cannot find a way to laugh, when it’s clear that there’s something funny going on. Especially when I can feel myself going to a place of judgment and rationalization about why I not only didn’t laugh, but “neither should anyone else. *” That’s when I have a sense of the things that I hold on to most rigidly. Some people have a hard time laughing at slapstick or physical comedy, others at comedy that makes light of body functions, still others have trouble when the humor in religious or patriotic practices is highlighted. I’m not talking about “making fun OF,” but noticing the humor. Our minds are a wonderful thing, and they can help us to overcome the barriers to growth that we put in our own way. Just think of how many times you’ve probably heard someone say that you can reduce your nervousness in a public-speaking situation or an interview by imagining your audience in a compromising way–say, in their underwear. It’s the rigid framing of what we’re doing, who we are, the groups we belong to, and what we believe, and many other things, that slowly builds to create a strong orthodoxy in our social behavior. It’s hard to defy an orthodoxy that has its hold on our very capacity to think. Try laughing at something you are doing or thinking over the next 24 hours, and notice how you can actually feel yourself loosen up. The cultural and group-bounded aspects of religious narratives and archetypes can put obstacles on our spiritual path if we fail to notice their mirage-like quality. Ultimately, a powerful and true archetypal narrative will take us to the same place, same be-ing, same awareness. By transcending our in-group certainties, we open up to the most beautiful and powerful capacities of what it is to be human. Similarly, by opening our hearts to see how we, too, contain within us the seeds of all that is ugly and destructive in the social world around us, we can respond in a productive way rather than adding to the chaos. We don’t become bearers of false good will, or masked ill will, but fully engaged in the world, aware of its complexity, and our explosive, but frail, natures. My biggest challenge in this area comes when I see outright unethical, unfair, and mean behavior that goes unaddressed or is not called out, out of fear. I know that when I call these things out, my own frustration and sense of entrapment by the dynamics of bullying, hostile environments, & harassment, color my tone with flashes of anger and fear that defeat my purposes. The mindful, compassionate solution to which I aspire is to be able to call out and address these things with an ontological trust that does not give my power to that which is untrue or unfair–nor hide it behind a mask of false civility. I can only hope to attain this level of presence, devoid of strategy, with practice–not a practice of how I ‘act,’ but a practice of being present, so that when I am challenged, I don’t ‘leave’ and allow myself to be embodied by spirits of fear, desperation, anger, guilt, fatigue, pretense, or even the joy that stems from an over-active ego.